(Nanowerk Spotlight) One of the key issues in building implantable neural interfaces is the guidance of axons, the individual nerve fibers that act as the primary transmission lines of the nervous system. "The ability to control the connections between neurons by guiding their axons on a chip surface offers several advantages," Christelle Prinz, a postdoc researcher in the Division of Solid State Physics at Lund University in Sweden, tells Nanowerk. "Among them is the possibility to address axons from different types of neurons, e.g., motor neurons from sensory neurons. This is a prerequisite condition for bidirectional neural implants such as brain machine interfaces." Axonal guidance has been achieved before, and there are various chemical and topographical modification techniques to do so. However, scientists only managed to control the orientation of the nerve fibers. In previous work for instance, Prinz and her collaborators have shown that they could guide axons along rows of nanowires with a high degree of fidelity (Axonal guidance on patterned free-standing nanowire surfaces). The problem was that the axons coming from two ganglia mounted on opposite side of the pattern would mix and they would grow in both directions. In new work that was recently published in Langmuir (Rectifying and Sorting of Regenerating Axons by Free-Standing Nanowire Patterns: A Highway for Nerve Fibers), the Swedish team shows that it is possible to impose a growth direction at a specific location on a substrate, something which is very important for neural chip construction for example. Prinz explains that they have used a rectifier pattern made of arrays of short rows of electron beam lithography (EBL)-defined nanowires to sort axons coming from different places on a substrate. The short rows of nanowires are oriented at an angle of 30° compared to the growth direction. The arrays define highways for axonal growth, preventing the axons to turn around and change their growth direction. "We not only show that patterns of nanowires can be used to rectify axonal outgrowth but we also demonstrate that axons from two different populations can be fully separated, thus creating the possibility to address two populations of axons on a chip surface," says Prinz. "These results, together with our earlier findings, provide a basis for the advanced control of neuronal growth on a chip, where a large range of functionalities can be implemented, including chemical sensors and electrodes to investigate neuronal function at high temporal and spatial resolution." Prinz points out two interesting findings from their research: "The first one is that the nanowire pattern influences axonal outgrowth well above the height of the nanowires. 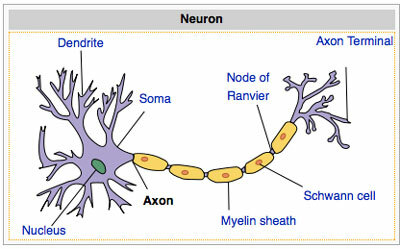 This is most likely due to axon-axon interactions and the tendency of axons to bundle, a phenomenon inherent to axons. The second one is that the guidance properties of the pattern are very powerful because one can observe both high and low nerve fiber densities on the same pattern without track crossing. It is also interesting how such very thin structures as nanowires can exert an influence on the much larger fiber bundles." Looking to future challenges for her team and researchers in this field, she notes that axonal guidance should take place in 3D, especially for prosthesis purposes. "Chemical modifications of surfaces are promising for designing 2D neural networks only" says Prinz. "Topographical modifications like nanowires or groves are a step towards guiding axons in 3D. Eventually, in order to be able to handle all the axons contained in a nerve in vivo, we have to start using 3D scaffolds."